In the seemingingly constant question of film versus digital, how many megapixels will it take to match film? Here more tests. The same lens and tripod was used: a Canon 500 mm f/4 Image Stabalized lens. A resolution test target was set up and imaged with a Canon Elan 7e (film), and a 6-megapixel digital camera (D60). In this test, say you want to image a target with each camera so that the target fills the frame to give the same picture. Because the D60 sensor is smaller than 35mm film, one would either need to change the focal length of the lens or the distance to the sibject betwen the 35mm camera and the digital camera to get a subject filling picture. For this test, the target was imaged with the 35mm camera and the 500mm lens then the target moved 1.6x further away and a Canon D60 put on the lens. The D60 was set at ISO 100 and highest quality jpeg image output. The Elan had Fujichrome Velvia ISO 50. The light illuminating the target was blue sky with 10-20% white clouds in the sky, but no direct sun. The digital camera had automatic white balance turned on. The film was scanned and both images had a levels adjustment so the brightest pixels in the image on the white paper were converted to white. No other color correction was applied. It is obvious which image is better. The film resolves the "2 px line pair." This line pair is separated by 4/300 inch (0.013 inch). At a distance of 26.2 feet that corresponds to about 8.7 arc-seconds. On film, that corresponds to 0.021mm or 48 line pairs per mm. Note, the digital camera does it's own internal sharpening. The film image was not sharpened, either by the scanning software, nor afterwards. You might try unsharp masking the film image; you can make it appear even better. The D60 resolves about 1.5 to 2x worse in this test. The test was done with multiple images, IS on and off, multiple f/stops, all with similar conclusions. For some applications, the smaller sensor of the digital might appear like an advantage. In the case of the D60, the sensor is 1.6x smaller, so because the field of view is smaller, it is like a longer focal length lens. This turns the 500mm f/4 into an equivalent 800 mm f/4 when used on the D60. But is the image quality equivalent? For this test, the target was kept at the same distance for each camera. The two images were scaled to be the same size for easier comparisons. Also, I tried all the ISO speeds of the digital camera (this too can be a great advantage in some situations, like low or changing light levels). The digital image at ISO 100, 200 and perhaps even 400 appears better than the Velvia film. (Note the film has not been unsharp masked like the in camera digital image; the film image could be improved in appearance a little with some unsharp masking). However, the test target is an idealized case for the digital camera, as the sensors line up with the lines of the target. The real world is not as organized. So below is a comparison of a rotated target. The test was done with multiple images, all with similar conclusions. 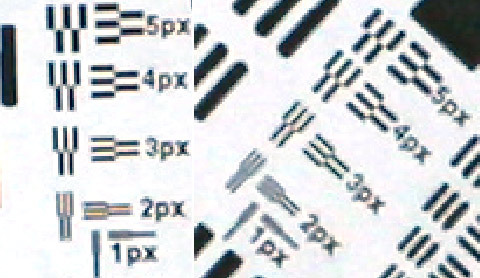 Here we see the image quality is substantially degraded when the lines are not vertical and horizontal. On average, real world images with the 6-megapixel digital camera will probably be quite comparable to the Fuji Velvia film, in terms of spatial resolition per square mm on the sensor. What this means is that given the same lens, the digital camera has similar resolution, but smaller field of view. The original velvia image could be cropped by 1.6x and give the same field of view as the digital camera with similar resoltion. (above) The color test target. This is the digital file. The file was printed on glossy paper for the imaging tests so the colors are not quite the same as here. (above) Canon D60 6 megapixel digital image using a 50mm lens at f/ll distance 16.8 feet. Note how the color bars on white do as well as the black and white bars. But the mixed colors on the right, do poorly when the target is small, especially compared to the Fujichrome Velvia, below. (above) Fujichrome velvia image using a 50mm lens at f/ll distance 16.8 feet. (above) Canon D60 6 megapixel digital image using a 50mm lens at f/ll distance 16.8 feet. Same image as the D60 image above but with color saturation +30 to more closely match what is observed with Fujichrome Velvia. The lower noise of the digital allows changing contrast and saturation with clean smooth results. The 6 megapixel camera has a similar resolution, but smaller field of view compared to Fujichrome Velvia 35mm film scanned on a 4000 dpi film scanner (a higher end scanner, like a drum scanner will retrieve more information from the Velvia; see the articles pages). Thus, there is no practicle advantage with regard to spatial resolution of the digital camera. 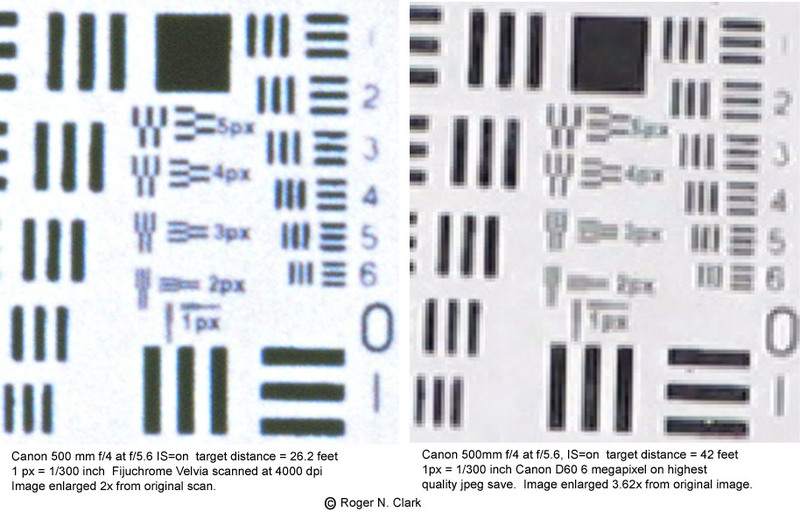 The 35mm film gives coverage over a larger field of view with similar spatial resolution. There are many other advantages to the digital camera, one being sensor speed allowing shorter exposures and thus the ability to work with lower light levels. The many other advantages to digital, like immediate image viewing, and will not be discussed here. The results here imply a full 35mm size CCD sensor with the resolution of the D60 would match the scanned information of Fujichrome Velvia. Since the sensor factor is 1.6, the megapixel content for this equivalence is approximately 1.6 * 1.6 * 6 mpixels or about 15 megapixels. This is similar to the conclusions on other tests on the articles pages. Last updated Nov. 24, 2002.